몬세라트에 있는 본 숙소(베 호텔)는 본격적인 부에노스아이레스 여행 시작을 위한 이상적인 장소입니다. 이 곳에서 생동감 넘치는 도시의 많은 것을 최대로 즐길 수 있습니다. 본 숙소는 Iglesia Presbiteriana San Andres, 센트로 국립 드 라 뮤지카, Libreria De Avila 등과 같은 도시의 주요 명소들과 가까운 거리에 있어 투숙객이 편리한 여행을 즐길 수 있습니다. 본 숙소(베 호텔)는 최상의 서비스와 다양한 시설을 제공하며 고객의 편안한 투숙을 위해 최선의 노력을 다하고 있습니다. 투숙객들은 숙소 내에서 Wi-Fi (무료/전 객실), 장애인용 편의시설, Wi-Fi (공공 장소), 룸서비스, 레스토랑 등을 즐길 수 있습니다. 본 숙소에는 멋스럽게 꾸며진 총 48개의 객실이 있으며, 대부분의 객실에 평면 TV, 무선 인터넷(무료), 금연 객실, 에어컨, 난방 등이 구비되어 있습니다. 온수 욕조, 피트니스센터, 사우나, 실외 수영장, 실내 수영장 등을 포함해 여가 시설이 잘 구비된 본 숙소에서 일상을 탈출해 편안한 휴식을 취할 수 있습니다. 이상적인 위치와 시설이 잘 어우러진 본 숙소(베 호텔)는 여러모로 제격입니다. Check in was quick and easy when we arrived. The room was a double, with a huge bed and the room spotless. The shower is an open shower and was kind of a special feature in the room, the room where the toilet is, is tiny. The staff are great and the room was always promptly cleaned and fresh towels etc, always replenished. There is a bar down on the basement floor which looked really quirky but we never got to go. The location is excellent, walking distance to the main area and within walking distance to bus routes and subway stations. The only negative I have is that it's very noisy to the front of the hotel, so if you can afford to upgrade the room and stay at the back of the hotel, do, as you"ll be disturbed during the night & woken very early otherwise. It didn't bother us, but it might bother some. I would highly recommend the Axel hotel, to anyone. A modern hotel with a funky vibe. The rooms are very comfortable, although natural light is minimal as the wardrobe takes up most of the space where the window is. Shower is also not for the prudish if you are sharing, being completely exposed to the room. Bear in mind that despite saying a gym is included, it comes at a cost of USD15 per day to use. We stayed here for a few nights before moving in an apartment in BA. Great hotel. Pool is amazing within a big sunny garden. Spa is great. Rooms are spacious with a great bath. We got an upgrade. Staff speaks english and is friendly and helpful. Helpful staff, great location, fun! Enjoyed this stay in a very modern, open architecture with very friendly people. 'Heterofriendly' is the motto of the hotel and it is indeed not only a place for the gay crowd but for everyone - I can fully recommend. Breakfast is good with great variety. Party by the pool on Sundays if you're into this. We didn't knew it was a homosexual hotel, but fortunately it is heterofriendly. Nice rooms. A fast and perfect check-in with the offer to help at any needs i have. The room was really nice furbished and some "special styles" were also on the run. The hotel also offers a nice bar/pool bar and a roof spa area. we stayed in axel for 6 days altogether (with 2 nights away to igauzu)with my partner. the hotel is modern, well-designed which suits the taste of gay people or fachionable tourists. the steel stairs, restaurant and bar downstairs as well as the outside pool are all well designed. the rooms are basically alright and the beds are comfortable. but the 100% transparent and no-door design of the shower room is not welcomed by us. the water splashed around after each shower. also, the rooms facing the road (venezuela st.)is very noisy because there are buses running until very late. that's why they supply ear-plugs readily in the room! the receptionists are generally helpful and speak english. the guy named alexis is especially helpful, which deserves my appreciation here! yet, it is located in a rather run-down neighbourhood, hence it seems unmatch with the surroundings. the side walks around the hotel are full of gabbages and trash, so be careful to walk around at night. the nearest restaurant is about 3 to 4 blocks away, so prepare to walk a bit. Nicely desiged hotel catering mostly to a gaycrowd (“heterofriendly”) 2 blocks from the trendy San Telmo area. It features a sunterrace and pool in the backgarden. There also a separate spa and extra pool on the topleavel but you have to pay extra fot hat (I didn´ t use it).Breakfast is very good but only served from 7.00-10.00 AM on weekdays, that’s quite early for a city where many people go out for dinner at 23.00 / 11 PM Some reviews focus on the fact that this neighbourhood is not safe at night but apart from the piles a garbage on the street at night there’s nothing to be afraid of, at least to my experience. The internet, bathroom, toiletries, breakfast. The hotel was kitted out superbly, with brilliant amenities and facilities. Unfortuanately the pool was out of action while I was there, but the staff were generally accommodating. I thought the location was fairly good for the San Telmo area and was close to good parilla and tango shows. The only problem I had was when I tried to book a day tour through the hotel but the guy forgot to phone the company, meaning I missed out and had to negotiated with the tour guide directly. Don´t be put off by the gay hotel tagline either, as I met other hetero travellers theere too. Breakfast was outstanding with some of the best dulce de leche I´ve tasted yet. The hotel was published as a 5 stars but it was not. Good Location and friendly staff. The room was too small. Gym , sauna and internal pool was not free. Need to pay extra to be able to go. This is not serious and was the first hotel in my life where this service was not free. 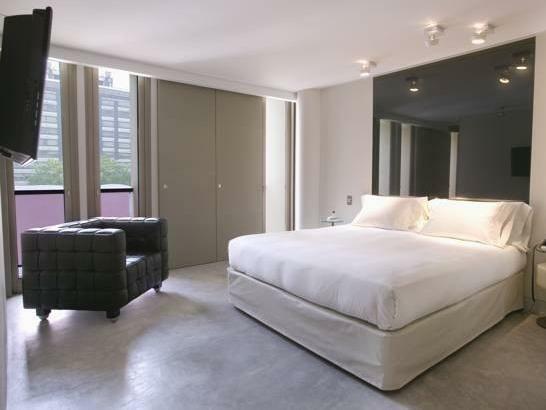 the axel hotel buenos aires is a fantastic hotel for a fun place to stay. the front desk staff are very attentive, remember guests by name and well, are quite attractive! the rooms are modern and stylish. minimalistic contemporary style. awesome bathroom. the outdoor pool area is excellent for chilling with drinks and listening to the music they play. i read people complained about the location, but there is nothing wrong with the location. i will be staying here when i return to buenos aires. Staff was mostly un-interested in assisting. axel hotel is well located, walk distance (15 m) from plaza de mayo and from the subte (subway), modern, clean and comfortable rooms. it has a great service. the staff is very helpfull and friendly. keep in mind that it is "hetero friendly". us as an hetero couple, really enjoyed our stay there. 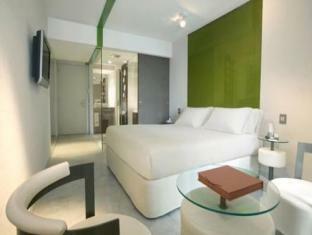 The Axel hotel is a good value for money place. Its minimalist style is really stunningmin both rooms and common parts. The pool is nice although not in the sun for long and in need of a refreshing. Overall service is good .